Malcolm X, a man who scared America. He generated fear that might have well cost him his life. But in this process of scaring us, brining us face to face with realities of our society, he had left America a better place. "You'll find very few people who feel like I feel that love long enough to get old. I'll tell you what i mean and why i say that. When I say by any means necessary, I mean it with all my heart, and my mind, and my soul. But a black man, should give his life to be free, but he should also be willing to take the life of those who want to take his. It's reciprocal. And when you think like that you don't live long." 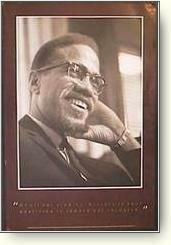 Click on the picture of above to visit a Great Web site about Malcolm X. To many the name Malcolm X means more than just a name of a man who took a lead in the movement. To millions across the nation this man held something many did not have. He represented, and remains representing something that other leaders did not. He, like other Black and white leaders was willing to risk his life to provide the people of America with justice. His words speak to todays time and will always be remembered. Malcolm X, who was one of the most important highlights in the Black Liberation Movement inspired black and white people all throughout the nation. To take a stand and claim the justice that they deserved. His speeches, so powerful they could move a nation, gave people the courage to act for their rights. Many people were fascinated with Malcolm and his bravery. One of the many movement groups who were inspired by Malcolm, was the Black Panther Party, this organization was a group of Revolutionary Nationalists, who shared common views about the movement. Even after Malcolms death, his words still remained. Without this mas leaderiship and strong will African American blacks all across the country wouldn't be where they are today. A brief Malcolm X time line. 5/19/25: Malcolm is born in Omaha Nebraska. 9/28/31: Malcolm's father Earl Little, is run over by a streetcar and dies, in Lansing Michigan. His death may have been due to the actions of a white supremacisy group. 1/9/39: Malcolm's mother Louise Little is sent to a state mental hospital in kalamazoo Michigan. 2/41: Malcolm moves to Boston Mass, to live with his sister Ella. 3/43: Malcolm moves to New York City. 2/27/46: Malcolm goes to prison for breaking and entering and armed robbery, in the Charlestown state prison. 1947-48: Malcolm converts to the Nation Of Islam while in prison. 8/7/52: Malcolm moves to Detroit michigan. 8/31/52: Malcolm is Givin his X, after hearing Elijah Muhammad speak in Illinois. 6/54: He becomes the Minister of New York Temple Number Seven. 1/14/58: Malcolm marries Betty X in Lansing Michigan. 7/62: Third Daughter Ilysah us born. 4/63: Malcolm meets with Elijah Muhammad in an attempt to resolve their differences. 3/8/64: Malcolm split with the Nation of Islam, announced in the New York Times. 3/16/64: Malcolm forms a new orginazation called Muslim Mosque, Inc.
3/26/64: Malcolm meets Martin Luther king Jr.
6/28/64: Malcolm X announces formation of the secular Organization of Afro-American Unity. 12/64: Malcolms fourth daughter Gamilah is born.